If I told you this film felt slow, what would you think of me? Would you question my patience? Even my taste? An Inn in Tokyo’s an Ozu film, after all; part of a body of work famed for its stately pacing. 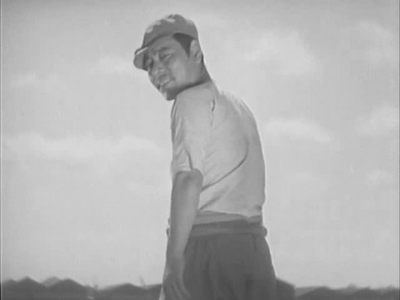 Ozu never, ever rushed. Part of any true film fan’s maturation is discovering his work, falling in sync with its gentle rhythms, and learning to love the way its images unfold. You don’t make time for Ozu movies; they give you time. And Ozu’s best films make the waiting worth it. But An Inn in Tokyo, one of the master director’s lesser-known silents, doesn’t always do that. The basic elements are familiar ones. Like most Ozu films, An Inn in Tokyo concerns the dynamics within one family and the conflict between generations. 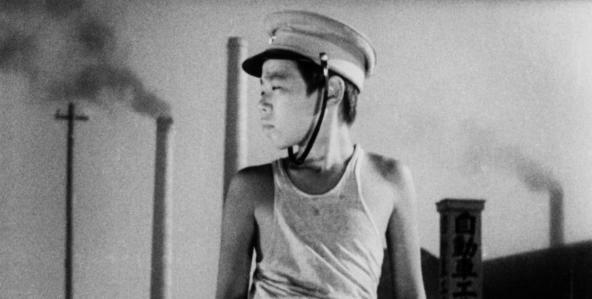 Like several of his films, including his great silent, Tokyo Chorus (1931), it is also about the strain of poverty. Kihachi (Takeshi Sakamoto) is a widower, and destitute. The film opens with him wandering the countryside outside of Tokyo—a flat landscape of scrub-grass and long dusty roads lined with factories every few miles or so, and cheap inns just beyond them. Kihachi needs work, desperately. “I’m a good worker,” he pleads to one factory gateman, who rejects him without a glance. Kihachi has two boys with him—his sons. One is about eight; the other about five. Every time Kihachi is turned down for a job, they buck him up. They blame the gateman. They tell him he’ll do better tomorrow. Meanwhile, they earn money on their own—chasing down stray dogs and taking them to the closest administrative building to be vaccinated for rabies. The government pays them 40 sen per dog. The boys adore their father, but their faith in him is understandably shaky. When they tell him he’ll do better tomorrow, they seem, to me, to be telling him what he wants to hear—or what they think he needs to hear. Their words are pragmatic, but not rooted in belief. This makes the generational tension in An Inn in Tokyo rather different than the kind found in other Ozu films. Usually, the shift in power from parent to child occurs naturally, either because the child has matured to the point where he or she is leaving the nest, or because the parents have matured past the point of being able to issue commands. If the children are still young, their power over their parents tends to be illusory—Ozu kids are often tyrannical brats, demanding everything from their parents, and often getting it, because the parents see their childrens’ happiness as a reflection of their own ability to provide. In An Inn in Tokyo, however, the kids must act with a maturity that belies their age. I’m not saying they’re portrayed as miniature adults—far from it, in fact—but they are, in a very real sense, Kihachi’s caregivers. They earn money for Kihachi; they provide him emotional support. They give him reason to go on. 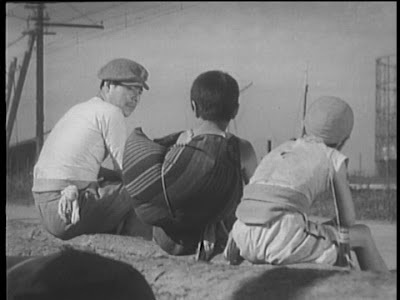 Ozu’s deeper purpose here, I think, is to examine how family structures are distorted by the extremes of want—making this film grim by the standards of his later work. Complimenting the shifts of power between father and sons is Kihachi’s de facto adoption of a sick little girl, whose mother, Otaka (Yoshiko Okada) is as poor as he is. At a time when he can barely afford to feed his own children, Kihachi takes on another dependent. His elder son, who earlier squandered precious dog-money on a new hat, is more selfish; but scarcely less responsible. All this is compelling stuff, expressed in long, beautiful, expertly composed shots that blur the literal stillness and sameness of Kihachi’s environment with the stasis that now typifies his life. Sakamoto, star of the superior Ozu silent, A Story of Floating Weeds, here portrays another pained but decent Japanese mensch; a regular guy with a hint of fatal weakness in him. But all of it takes longer than it needs to. 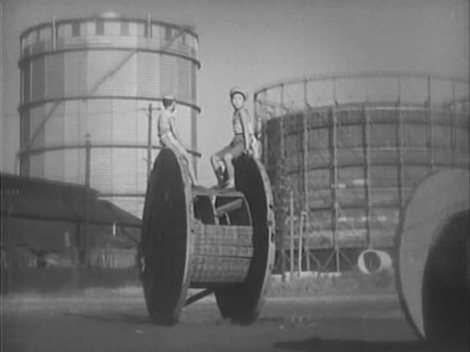 Ozu stretches a too-thin narrative too far. I think the best of An Inn in Tokyo can be summed up by its most memorable scene, which is brief. Kihachi, down and broke, sits on the grass and plays a game with his sons: He has them fantasize about what they’d like to eat if they had the money. Kihachi wouldn’t eat anything; he would spend all his money on sake. So his older son pours him a bowl of invisible sake; which the father holds, in pantomime, and sips, as though it were the best drink he’d ever had. When the action is done, his son pours him another. And on they go, until Kihachi’s thirst is slaked. The boy is a boy, so he knows how to keep another kid happy. Special thanks to Eric at Ozu-san.com, who read my plea for more Ozu silents on Twitter, then very kindly mailed me four I’d never seen. I will review the other three later in the year. An Inn in Tokyo is part of Ozu’s unofficial “Kihachi Trilogy”--three films so named because they all star Sakamoto in the role of a man named Kihachi. Criterion has released the other two films, Passing Fancy (1933) and A Story of Floating Weeds (1934), on DVD. Ultimately it's a matter of taste, but I don't think Ozu stretched a too-thin narrative at all. The narrative is not simply within the story, it is within the entire framing of everything, this is the beauty of cinema which we often forget when watching films. This isn't style over content or - long static shots over narrative - the style forms most of the content.